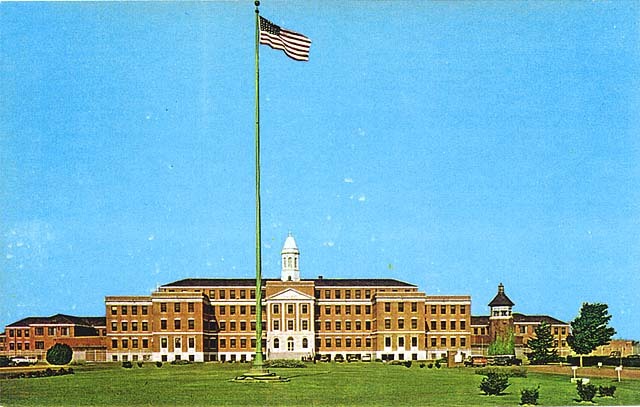 This is a color photocopy of a postcard showing the main building of the United States Medical Center for Federal Prisoners. A huge flagpole in the center of a green area is shown flying the American flag. The Medical Center was built at 1900 West Sunshine Street, the corner of Wabash and Sunshine. During the Great Depression, the people of Springfield gave 620 acres of land to the federal government to build the hospital. Congress acted to create the Medical Center in 1930. The first buildings were completed in 1933. The unoccupied land was originally used by the prisoners for farming. In 1966 this farming was abandoned. In 1977 the federal government returned some of the original 620 acres to Springfield. 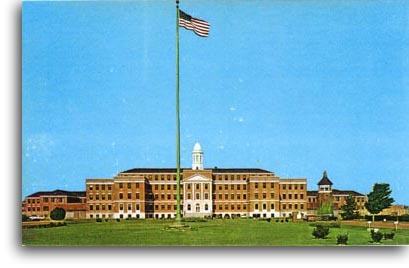 The hospital was created to care for the physical and mental disorders of federal prisoners in prisons all over the country. There are over 90 of these prisons now. Patients range from minimum-security to maximum-security inmates. Patients are transported from their home institution to the Medical Center by automobiles, institutional buses and airplanes. Every two weeks a 94-passenger airplane starts at the west coast and jumps all the way to the east coast making many stops to pick up and drop off passengers across the United States. If a patient has an acute condition he is either brought to the Medical Center by chartered plane or is treated in a local hospital. All chronic problems are treated at the Medical Center. The Medical Center is staffed by over 500 full-time employees. These include correctional officers and medical personnel such as doctors, nurses, dentists, psychologists and surgeons. The Medical Center is one of Springfield's major industries. There are no women federal prisoners housed at the Medical Center. They are treated by local hospitals wherever they are inmates. The first superintendent of the Medical Center was Dr. Marion R. King. Some other notable superintendents were Pat Keohane, who was a native of Springfield and ran the prison from 1995 to 1999, and Pat Ciccone who ran the Medical Center from 1965 to 1978. The Medical Center had three riots during its existence, in 1941, 1944 and 1959. All three riots were brought under control with tear gas. The 1959 rioters captured five hostages. It was the only riot with any casualties. One prisoner was killed as an assault force rescued the hostages. One hostage was also slightly injured. Many famous people have spent time in the Medical Center. Among them are John Gotti, Robert Stroud (the Birdman of Alcatraz), and Larry Flynt who apparently liked Springfield so much he considered buying the Elfindale Manor in which to live and perhaps start a magazine. The convicted terrorist Omar Abdel Rahman, also called the "blind sheik," also spent time at the Medical Center.